Every year the annual Bell Let’s Talk day is an event that is devoted to promoting mental health by aiming to increase the conversation around mental health on social media. For every text, email, post, Instagram, tweet etc... This year on January 30th 2019 Bell will donate 5 cents to supporting mental health. While the initiative itself has been integral to raising money for mental health support it is also an incredibly important way to increase the conversation around mental health and how one can get mental health support. The goal is to get people talking about mental health in order to transcend the stigma that is associated with taking care of our mental health. More than anything this is a day to remind us to be forward about mental health; to give a subject that should be on our minds every day of the year a voice, a medium to be heard on. It is a way to remind those who are struggling that even though people don’t say it everyday, you are seen, you are supported and you are loved. Participating in Bell Let’s Talk does not mean that you have done your due diligence to support mental health for the year. What it means is that here and now you are using this medium and your voice to commit to supporting the mental health and wellbeing of every person on the planet all the time. This means being thoughtful, being generous, being kind; because beneath our calm, cool and collected exteriors you have no idea the battle that each and every person is fighting. Mental health is something that affects each and every one of us. The same way that physical health affects each and every one of us. See we all have a mind, the same way we all have a body. Support for mental health is available everyday from friends, family, healthcare practitioners, hospitals, private and public treatment centres, help telephone lines and much more. What is so incredible about Naturopathic Medicine is that it is one of the paradigms of medicine that looks at supporting the whole person- this includes physically, mentally, emotionally and spiritually. 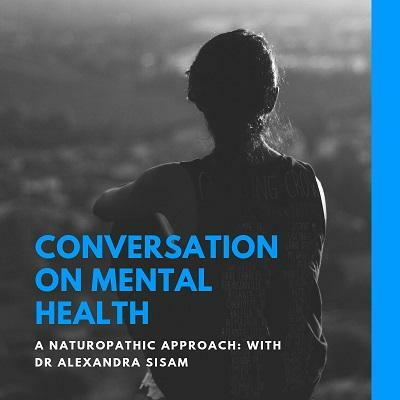 Modalities that we use including acupuncture, Traditional Chinese Medicine, botanical medicine, nutrition, and mind-body counselling all focus on supporting ones mental health and wellbeing in various ways. As a Naturopathic Doctor supporting and nourishing mental health is something that I am very passionate about. I have a special interest in treating depression, anxiety, eating disorders, stress, trauma and grief. If you are in need of support for one of these conditions or for any mental health struggles my doors are always open.